This is the first full-scale study of interactions between Italy's religious reform and English reformations, which were notoriously liable to pick up other people's ideas. The book is of fundamental importance for those whose work includes revisionist themes of ambiguity, opportunism and interdependence in sixteenth century religious change. 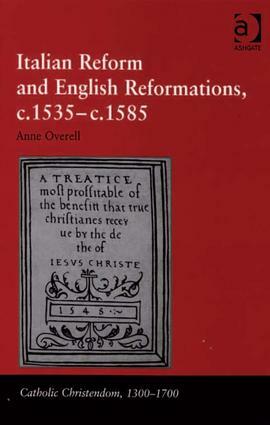 Anne Overell adopts an inclusive approach, retaining within the group of Italian reformers those spirituali who left the church and those who remained within it, and exploring commitment to reform, whether 'humanist', 'protestant' or 'catholic'. In 1547, when the internationalist Archbishop Thomas Cranmer invited foreigners to foster a bolder reformation, the Italians Peter Martyr Vermigli and Bernardino Ochino were the first to arrive in England. The generosity with which they were received caused comment all over Europe: handsome travel expenses, prestigious jobs, congregations which included the great and the good. This was an entry con brio, but the book also casts new light on our understanding of Marian reformation, led by Cardinal Reginald Pole, English by birth but once prominent among Italy's spirituali. When Pole arrived to take his native country back to papal allegiance, he brought with him like-minded men and Italian reform continued to be woven into English history. As the tables turned again at the accession of Elizabeth I, there was further clamour to 'bring back Italians'. Yet Elizabethans had grown cautious and the book's later chapters analyse the reasons why, offering scholars a new perspective on tensions between national and international reformations. Exploring a nexus of contacts in England and in Italy, Anne Overell presents an intriguing connection, sealed by the sufferings of exile and always tempered by political constraints. Here, for the first time, Italian reform is shown as an enduring part of the Elect Nation's literature and myth. Contents: Introduction; Englishmen and spirituali; Bernardino Ochino in London; Edward Courtenay and Il Beneficio di Cristo; The Italian connection at Edward VI's court; Peter Martyr Vermigli and his English friends; Venetian exile and English propaganda; Pier Paolo Vergerio and Cardinal Pole; Elizabethan aftermath, 1558-1572; A literary epilogue; Bibliography; Index. Dr M. Anne Overell is Honorary Fellow, Department of Theology and Religion at Durham University, UK.